Anne in Australia left me a comment that she and her group we able to construct the Envelope Number Line that I described in my two previous posts, but, in her words, ” our group of 4 found it difficult to fold it into a book which was predominantly our aim.” I responded to her comment by emphasizing that if they were careful about making sure that the title page stayed visible during the back and forth folding process, that things should go well. But that’s not the whole story. A tricky part of this structure is how it opens back up after having been folded into a square. I first came across the bones of this structure decades ago in the NYC Patent Library. 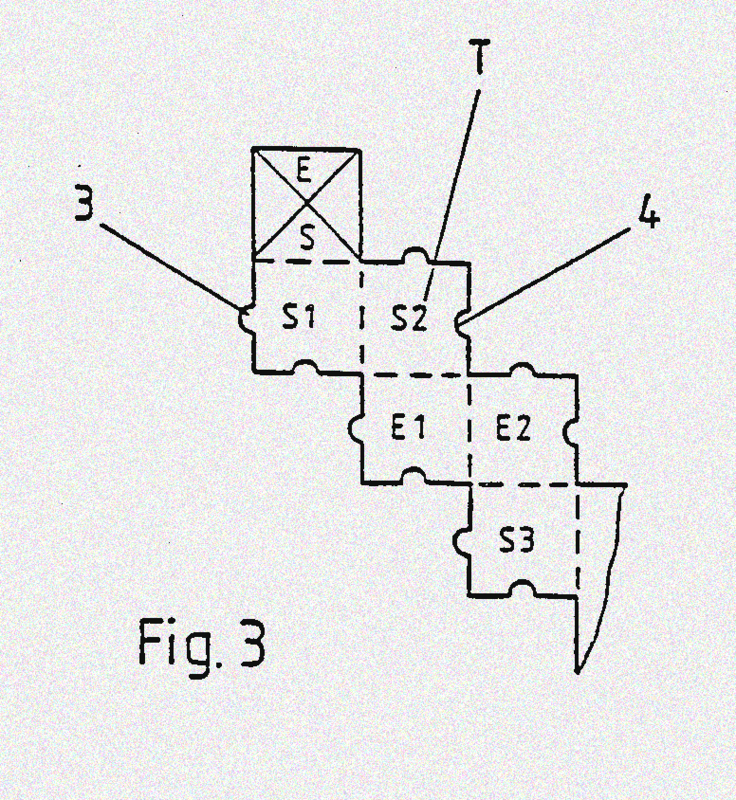 The drawings here come from this patent, # 4,856,818, It’s title is Folded Record Medium and a Blank for a Record Medium, Inventors: Horst Rabenecker and Jurgen Kruger. While my variation of this form deviates from the original in both intent and construction, one of the most interesting characteristics of this book remain, which is that it opens from the left, from the right, from the top and from the bottom, each time revealing a different sequence of pages. Using my directions for a Number Line book doesn’t rely on this novel way of manipulating the pages, so I didn’t pause to emphasize this atypical page turning: I’m thinking that this is what may have stymied Anne’s group. Folded Record Medium and a Blank for a Record Medium, Inventors: Horst Rabenecker and Jurgen Kruger US Patent # 4,856,818 A perspective view of the record medium in the folded state. Once this structure is folded up into a square it can easily be unfolded into its completely long, wavy state, but unfolding it page by page can seem like a challenge. 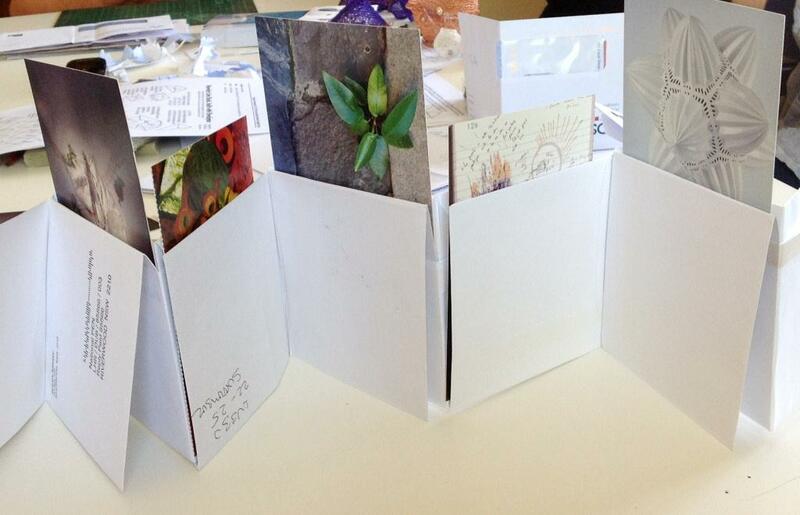 Think about the simple accordion fold: although we generally open an accordion from one side, like a typical book, an accordion book can be opened with equal ease from both sides. Content can exist on the front and the back of the accordion and be equally accessed from a left side opening or a right side opening. 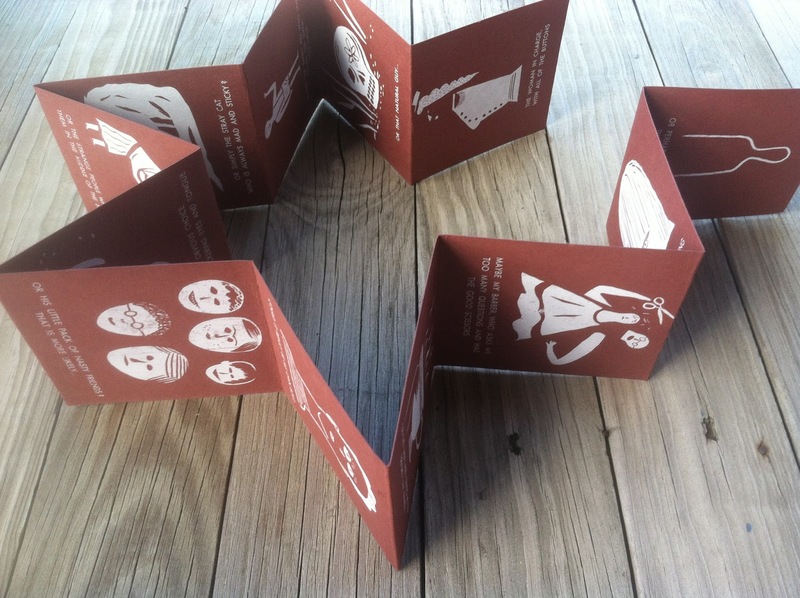 The image below, a book by Lilli Carre, is a good example of an accordion that opens uses both sides of the accordion. 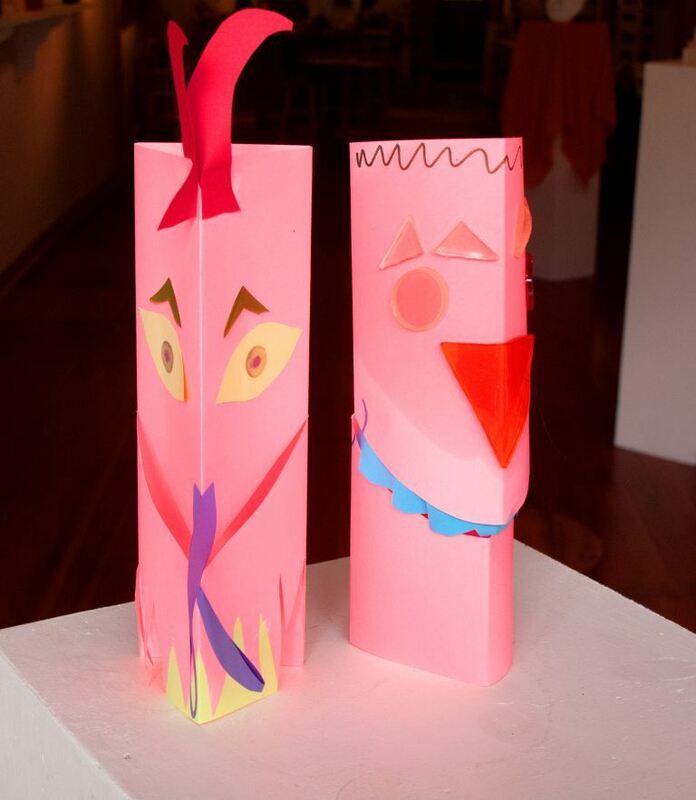 By the way, I found this image of Lilli Carre’s during a search for 2-sided accordion books. I was surprised by how few examples I could find of a book that showed images on both sides of the paper. Thank you, Lilli, for such a great example of an accordion that uses both the front and back. 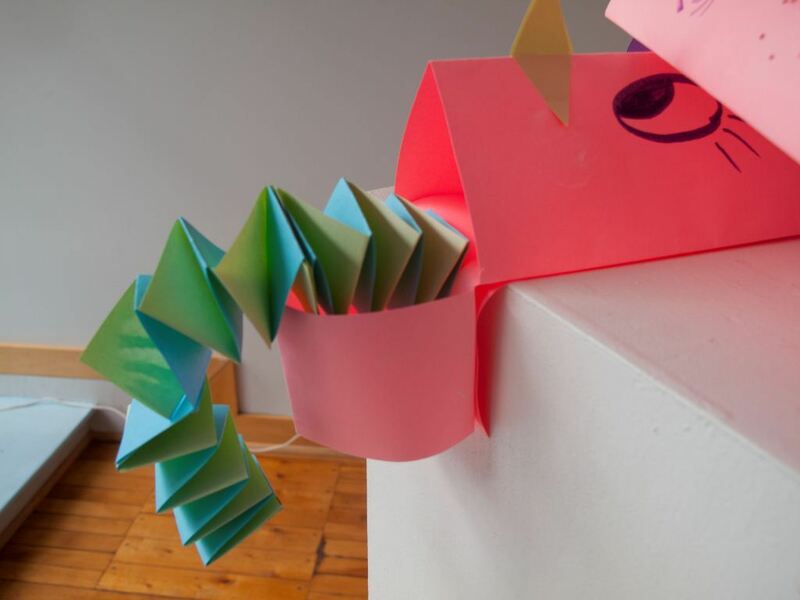 The Folded Envelope Book that I describe in my two previous posts goes a whole step further than the accordion that opens from both the left and right, In addition opening form the left and right sides, it also opens from the top and bottom. The rub is that we’re just not used to a book that opens in four directions. So there you have it. 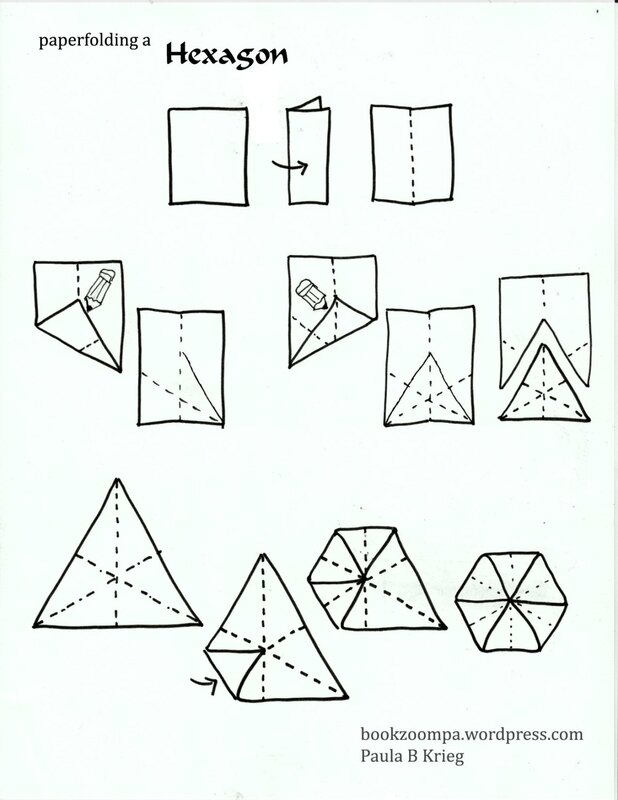 If you attempt this structure, which Anne noted was easy to make, be prepared for some conceptual challenges. 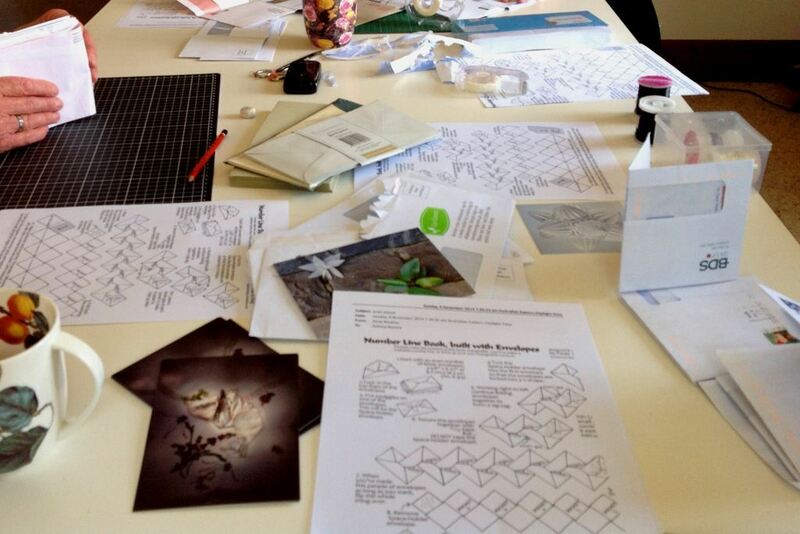 Anne sent me photos of her group working on this envelope-pockets structure! 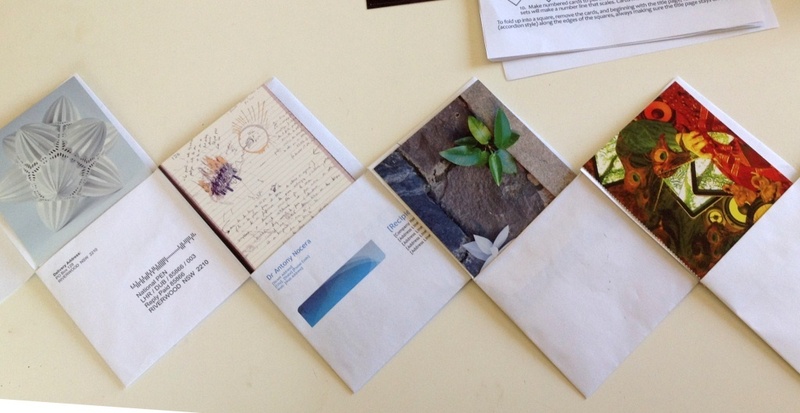 What I noticed about this right off was that they utilized used/recycled envelopes as well as blank ones. I loved the character that this gave to their books: really personalized. It looks like they discovered various ways of setting this book up to display content. I like how the pictures are at different heights here. It seems to invite me to pluck one picture to take home. Fun and lovely! Thank you to Anne and her friends for sending these photos to me, half-way around the world. The beauty of this structure is that it can be made out of just about any size and proportion of paper. I generally use regular size copy paper, but anything works. It might be hard to tell from these photos, but the mouth of the puppet articulates, and opens in a wide and humorous. way. The workshop participants decorated their creations with all sorts of bits of this and that . The next photo is a of a puppet that looks it might have much to say. I find myself wishing that there were words on the paper that is cascading out of the mouth. 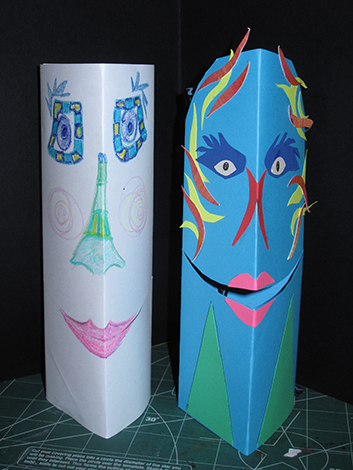 And here are a couple more of my own puppets. I will be teaching this again at a workshop in the fall, in Waverly, Pennsylvania, so I am going to try to put together a little tribe of these funny faces. Again, the magic of these is the when the mouth open and closes. It’s such a surprise to be able to put together such a whimsical creature so quickly. If you try this out, please email me a photo! One of my all-time favorite paper moments was when I learned how to fold a regular hexagon. 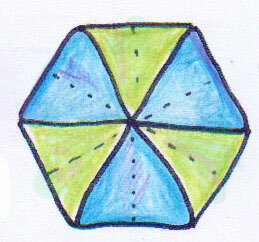 Many times, with protractor or compass in hand, I had tried to draw hexagons, but they never worked out just right. This post, which features a tutorial page, is something that I have been wanting to do for a long time, but I needed to stumble upon just the right random instant of blog time. Recently, while musing about life, the universe and everything, well it seemed like the right time to finally put these drawings and steps down on paper. After all, the six goes neatly into 42. Now, if you go ahead and make a hexagon for yourself, which of course you will because who could possibly resist trying this, you might notice a few splendid things. Then again, you might not notice them, so I will point them out. First, you will notice that a preliminary step towards hexagonism is that you create an equilateral triangle , which is just the first of the many perks of this activity. 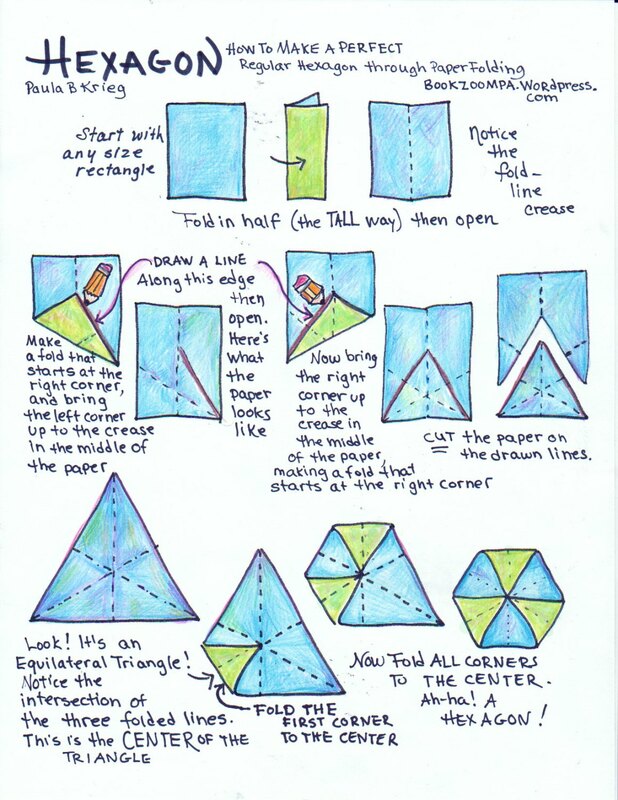 The second, most extraordinary flash will be when you realize that the intersection of the three folded lines within your triangle is actually the center of the triangle. The reason that this is so remarkable is that this intersection point in no way looks like it’s at the center of the triangle. It just looks wrong as a center, and you might not believe it. But when you bring the tips of the triangle in to meet the intersection, well, let’s just say you will believe. Just for fun, I decided to include this set of directions, too, because, really, it’s a much more attractive page than the one with all the writing on it. And there are plenty of people who will try it out without reading a thing, so here you have it. Now after you’ve noticed that you’ve made a big equilateral triangle, there are few more shapes to uncover. First of all, there are all sorts of little equilateral triangles inside of the hexagon. And if you fold the hexagon in half, well, you will have made an isosceles trapezoid. Now, think back, when is the last time you actually held an isosceles trapezoid in your hands? Next, fold back a third of the trapezoid, and there you have a rhombus. And if you can’t remember what any of these shapes are it’s probably because you never learned to spell them. Really, what it is it with this terminology? Wouldn’t these all these shapes be more memorable if we called them lollipops or kiwis? A special nod here to Christopher Danielson. math teacherblogger who recently had way too much fun using hexagons in his classroom, so I wanted to add something to the virtual hexagon mix. And I want to acknowledge Steve Morris, who kept me thinking way too long about the edges and shape of the universe: I no long think that the universe is shaped like a hexagon. That was just silly. Now I think it’s the shape that’s made when hexagons and pentagons are fitted together, -but don’t be looking for a post about that. I think I need to get back to making books. Rectangular books. Click on this image to enlarge and print! One of the reasons that I started an on-line site is that I wanted to keep a record of things that I didn’t want to forget. 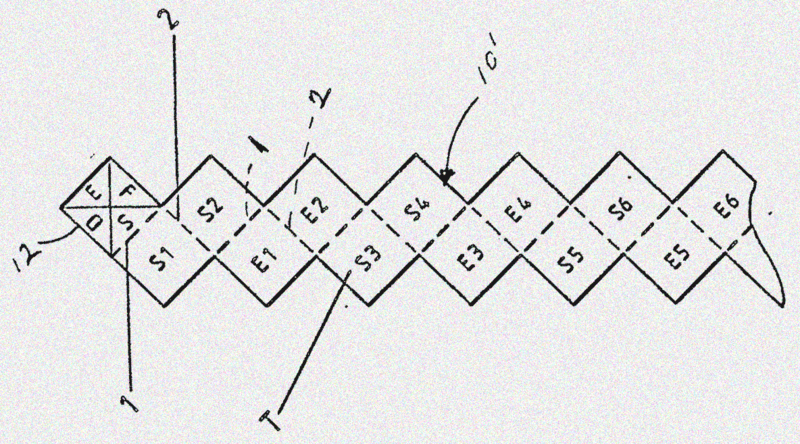 The paper-folding sequence shown above is one that I have already forgotten once. 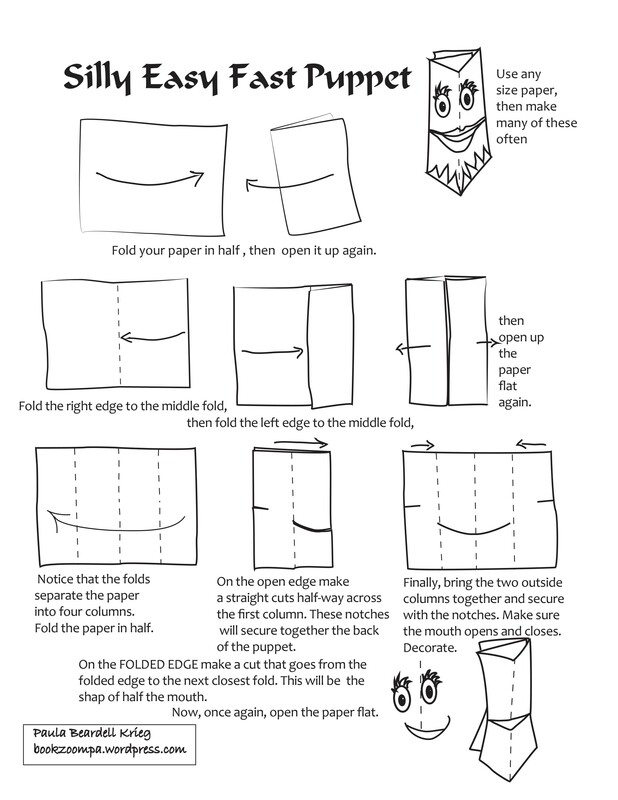 Fortunately, James Higby, who learned it the same day that I did, something like 15 years ago, continued to make these folds, and I was able to look at an envelope he made, then recreate the steps for this post, which will now forever be at my fingertips. Since it’s the season to write thank you notes, this seems like the right time to post these instructions. What I like about this structure is that I can start with a standard size paper, which I have either created an image on or not , then make a sequence of folds which transforms the paper into an envelope that has a precious feeling to it. 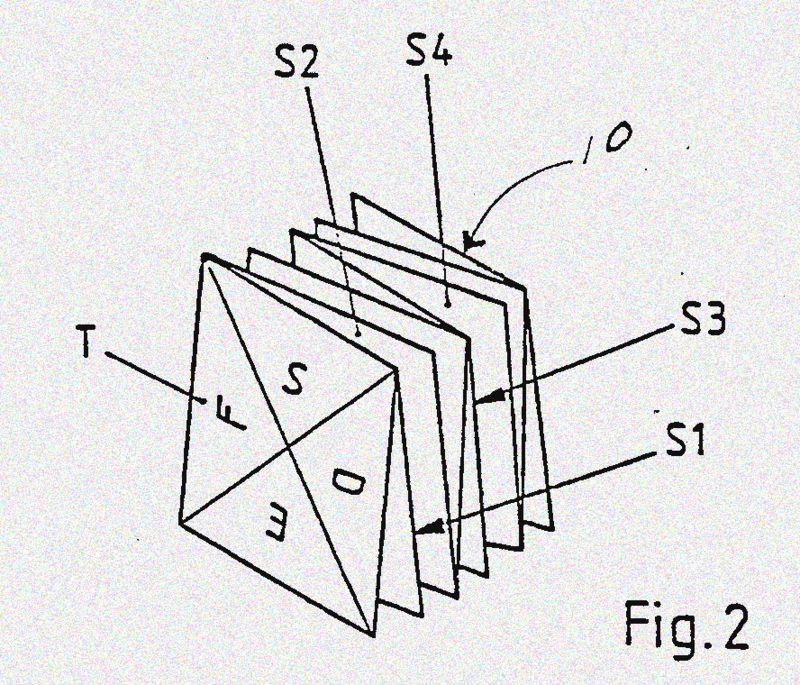 …then be advised that the image should be visible after the first fold. The fun thing about using printed paper is watching how the image is transformed by the folds. I have to say that I am partial to the envelope on the lower right, which is the stock page scavenged from the Wall Street Journal. A perfect thank you envelope for a gift of money? Once you’re done with your thank you notes, may I suggest that you take a look at Hannah Brencher’s site http://www.moreloveletters.com/? 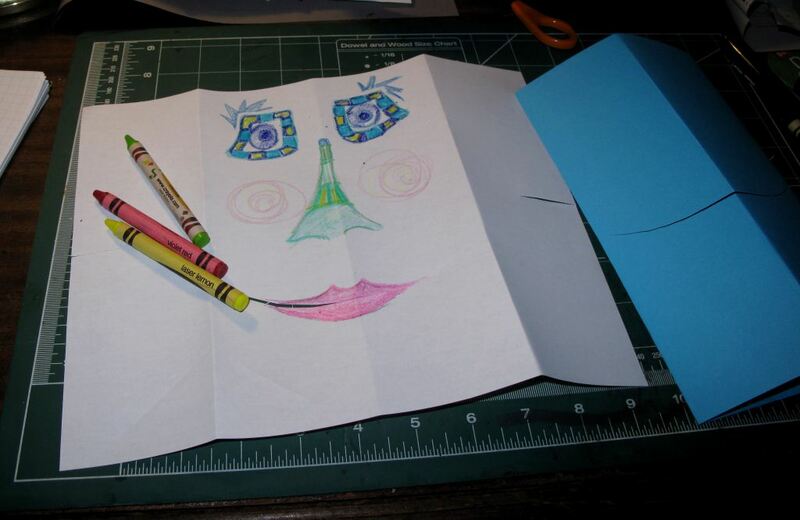 Each week her organization mails out a “bundle of love letters to a person in need. Sign up for the Love Letter Alert List to get the letter request in your inbox.” Very cool.